Every snowflake is unique! 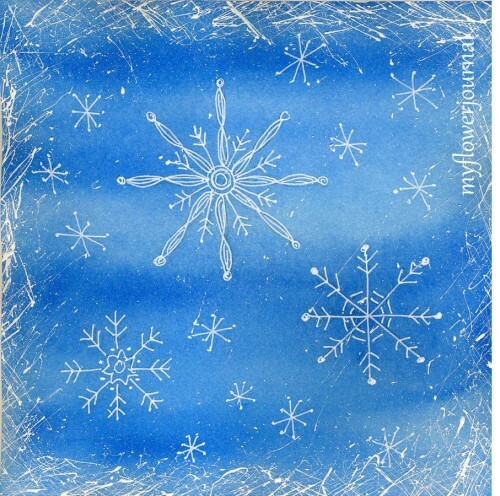 This is why creating snowflake doodles on a watercolor background is so much fun. You can use your imagination to create all kinds of beautiful designs. I created my snowflake doodles using a white gel pen. I splattered acrylic paint around the edges to give my piece a “frosted window pane” look. You will want to practice drawing snowflakes first. You can look on google images if you need some ideas. 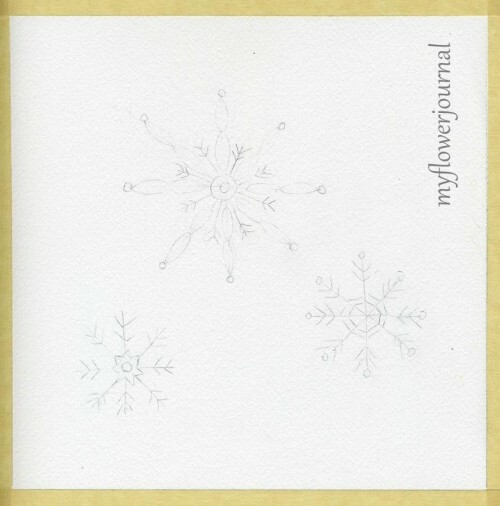 When you have some snowflake doodles you are happy with draw them on a piece of Watercolor Paper in pencil. I did my designs on 9×9 piece of paper taping the outside edges so the finished art is 8×8 inches. Next do a dark **watercolor wash over the whole paper. Remember watercolor dries lighter so make it dark enough the white gel pen will show up. **Watercolors: After taking a watercolor class on Craftsy I now use the Daniel Smith Essentials Set (a limited palette) plus a few favorite colors for most of my watercolor projects, but there are times when its nice to premixed colors like the ones found in the Koi Watercolor set. If you look close you can still see my snowflake doodles. I went over them lightly with a pencil then traced over them with a white un-iball signo gel pen. A white sharpie paint pen would work too. Start at the top and work your way down so you don’t smear the white ink before it dries. The last thing I did was splatter white acrylic paint around the edges to give it the look of a”frosted window pane”. I used a round mixed media brush and acrylic craft paint. Acrylic paints from a tube are too stiff. 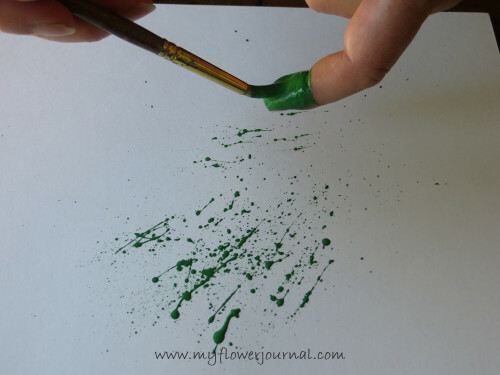 Load your brush with lots of paint to make the longer splatters. 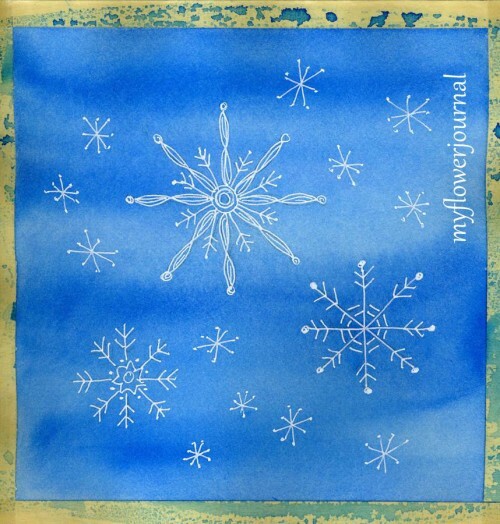 If you don’t want paint splatters on your snowflake design cover it with paper towel. I splattered the paint in different directions to give a cross hatched look. You could also do cross hatched lines with your gel pen. You can read more about my splatter painting techniques here. Watch a video of me splattering paint here. Remove the masking tape and trim the edges and you have a beautiful piece of winter snowflake doodle art. This is gorgeous, Tammy. Thanks for sharing your process. Tammy, what a fun project to do with my students. I would use toothbrushes instead of the paint brush, but still a fun project! LOVE it, LOVE it & Thanks for sharing! I’m definitely trying that! O my goodness, I love this. Love snowflakes and have got some snowflake stamps but now I’m going to try and doodle them! Love the backround too! Thanks for sharing your techniques. Lovely snowflakes. Congrats on being chosen for PPF this week. Beautiful and festive! Congratulations being featured this week on ppf!! Wow what a fun idea, thanks for the tutorial!! !Love your work!!! so good to see your unique art again Tammy. Congrats on that beautiful art gracing the PPF homepage this week! Lovely winter themed cards.